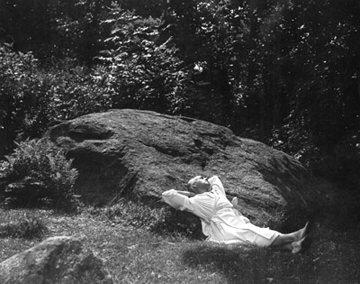 Modern dance pioneer Ted Shawn bought the Jacob’s Pillow farm in Becket, MA. in 1931. 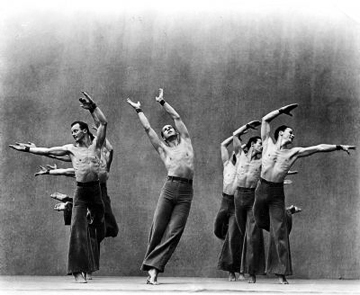 Shawn had long harbored a dream of legitimizing dance in America as an honorable career for men, and in 1933, he recruited eight men for a new dance company. In July 1933, Ted Shawn and His Men Dancers started offering “Tea Lecture Demonstrations” in their barn studio (now known as the Bakalar Studio) to promote their work— Ted would lecture about dance and choreography while the men performed. 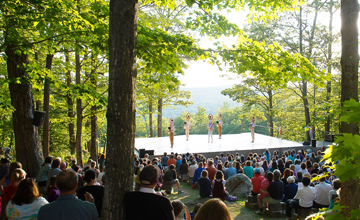 This established roots for what was to evolve into Jacob’s Pillow Dance Festival. “The Pillow” is a 220-acre National Historic Landmark, a recipient of the prestigious National Medal of Arts, and home to America’s longest-running international dance festival. Thousands of people from across the U.S. and around the world come to experience the Festival with more than 50 dance companies and 200 free performances, talks, and events; explore the Pillow’s rare and extensive dance archives. The School at Jacob’s Pillow is one of the most prestigious professional dance training centers in the US. I’ve been to The Pillow several times and a new addition was the fine dining experience at Haven at the Pillow. We had an excellent meal then walked the grounds checking out the rock/ pillow that gave this wonderful place its name, the gallery, the store, the outdoor performance space: Inside/Out, the dance studios, and the 2 theaters. 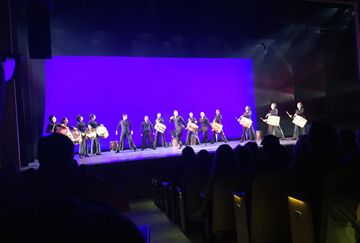 We came across several summer interns (from across the US and Europe) and many of them are dancers, others in public relations and learning about dance history, performances, events, and management. “It’s just like summer camp” several of the interns recounted.